Tracks 1-2 from "Hiroshima, mon Amour". Music by Giovanni Fusco (T1) and Georges Delerue (T2). Track 3 from L'Ann�e derni�re � Marienbad". Music by Francis Seyrig. Track 4 from "Muriel". Music by Hans Werner Henze. Track 5 from "La Guerre est finie". Music by Giovanni Fusco. Track 6 from "Je t'aime, Je t'aime". Music by Krzystof Penderecki. Performed by "I Musici Cantati di Varsavia". Tracks 7-9 from "Stavisky". Music by Stephen Sondheim. Track 10 from "Providence". Music by Mikl�s R�sza. Track 11 from "Mon Oncle d'Am�rique". Music by Ari� Dzierlatka. Tracks 12-14 from "La Vie est un Roman". Music by Michel Philippe-G�rard. Track 15 from "L'Amour � Mort". Music by Hans Werner Henze. Performed by "The Fires of London". Tracks 16-18 from "Smoking / No Smoking". Music by John Pattison. Track 19 from "On conna�t la Chanson". Music by Bruno Fontaine. Tracks 20-21 from "Pas sur la Bouche". Music by Maurice Yvain. Track 22 from "Coeurs". Music by Mark Snow. 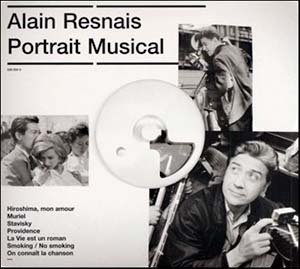 Bonus Track from "L'Atelier d'Alain Resnais". Music by Bruno Fontaine.